Checked, Tested, Maintained, OSH and Work-safe compliant. Our Auckland scaffolding plank hire division of GHL (formerly NZ Plank Hire) commits to excellence. Teamed with our vast industry experience in scaffolding plank hire and our On Time, Every Time guarantee. We can help your job or site be more efficient with rapid deliver Auckland wide. We have been working with the Auckland scaffolding market, construction companies, builders, bricklayers and DIY markets for over 15 years. 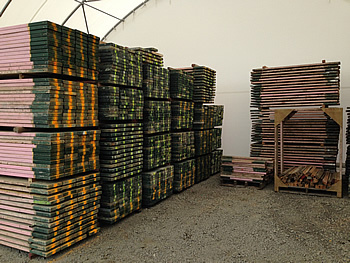 All our Wooden Scaffolding Planks are NZ manufactured and are guaranteed to be fully compliant to all NZ standards, we have in stock scaffold planks in various lengths from 1.5m - 3.0m Long ready for immediate delivery. With thousands of scaffolding planks and every scaffold plank is checked, tested and maintained after every job to meet scaffolding best practices, OSH and Worksafe compliant – you, your workers and your worksites safety is vital to GHL. Our scaffolding planks are New Zealand through and through! 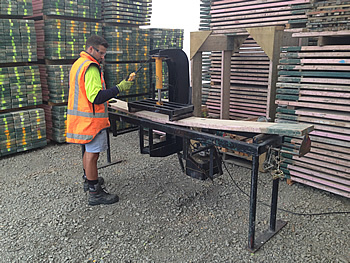 Not only is GHL a 100% New Zealand family business but our laminated wooden scaffolding planks are manufactured in New Zealand by a fully licensed laminated scaffold plank manufacturer. Each plank is made up of seven Radiata pine laminations without finger joints or scarf joints to ensure strength. They have radiused edges and ends to reduce deterioriation from the elements and use. They also have a bandsaw finish, two screws at each end to control end splitting. From just one phone call, your scaffolding planks with be delivered onsite for any short or long term hire options at very competitive rates. As an Auckland scaffolding plank hire business, GHL predominately services from Mercer to Mangawhai including Auckland, Franklin, Counties, Waitakere, Hibiscus Coast, Eastern Suburbs Franklin, Manukau, East Auckland, West Auckland, Auckland CBD, North Shore, and Rodney District. However, depending on your requirements, GHL can also assist from Hamilton to Whangarei – call us now to discuss. 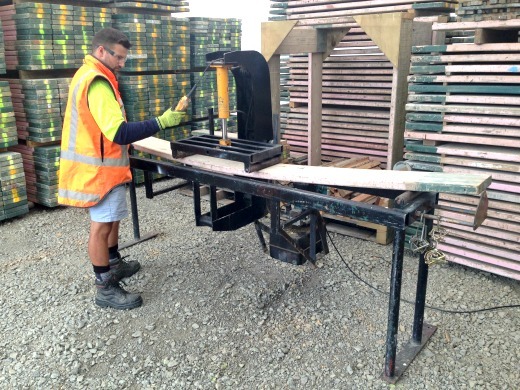 You relied on NZ Plank Hire – you can rely on GHL for the same helpful people with the safe scaffolding planks and fast service. From Day 1 we’ve recognised that when our Clients Need Planks they Need Them and Quickly. 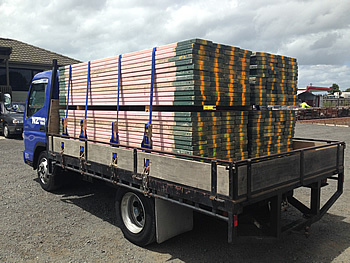 We pride ourselves on Delivery within 24 hr’s Auckland wide and our Plank Hire Truck can carry up to 200 Planks. NZ Scaffolding Plank Hire provides short or long term rental options at competitive hire rates. Subject to a minimum charge including delivery / pick up of $130.00 + G.S.T. At GHL Plank Hire, we take safety very seriously and we regularly inspect and strength test our scaffolding planks. Planks are visually inspected each time a scaffolding plank is handled and we also test our scaffolding planks regularly following our in-house checklist to ensure complete compliance with WorkSafe standards. Our number one rule is ‘If in Doubt, “Write it Off”’ so you can rely on GHL Plank Hire for safety.